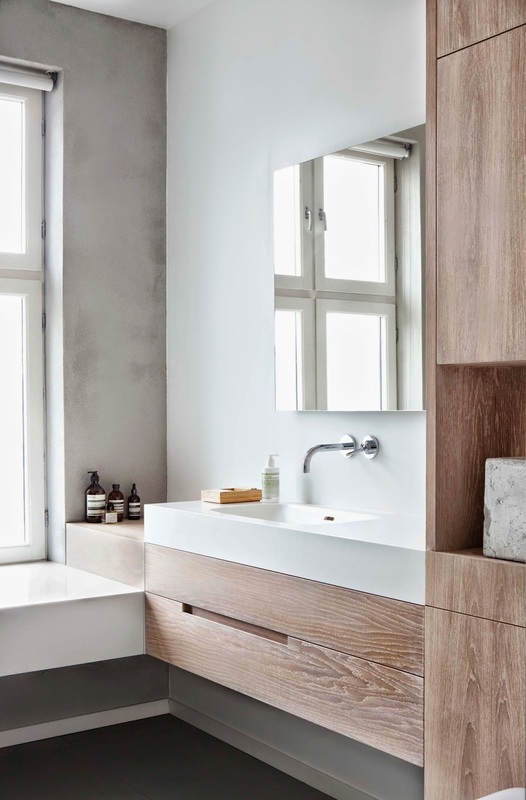 London based studio Haptic recently completed this renovated loft in Oslo, Norway, based on simplicity of tones and materials and featuring an airy, minimalist suspended staircase, a bespoke kitchen with open fire and a double height bathroom. 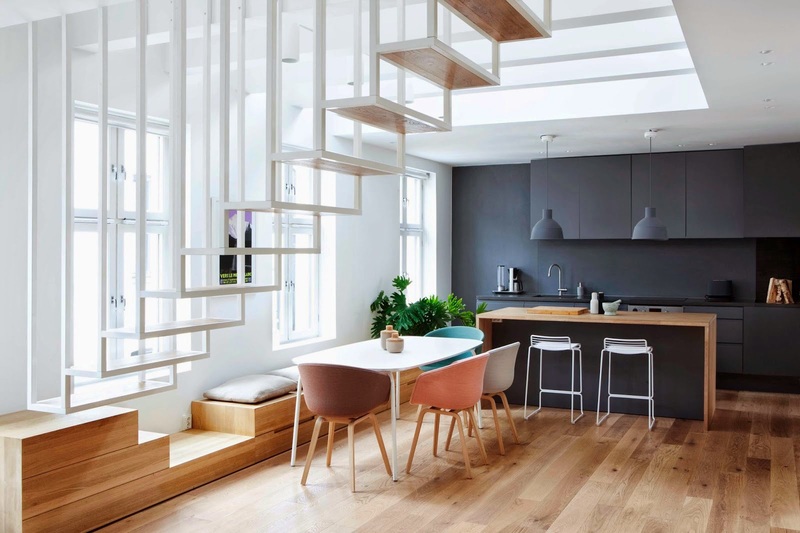 The new powder coated white steel staircase connects the different levels of the apartment, located in the upper levels of a nineteenth century block, also dividing kitchen from living spaces. 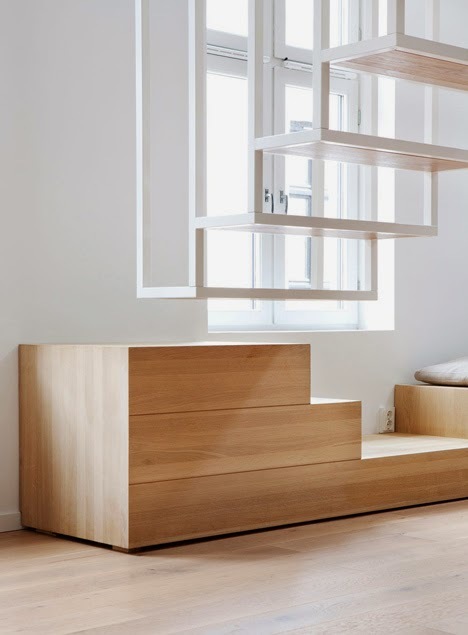 A low piece of wooden furniture functions as the base of the staircase, storage space and seat. Photography © Simon Kennedy and Inger Marie Grini. 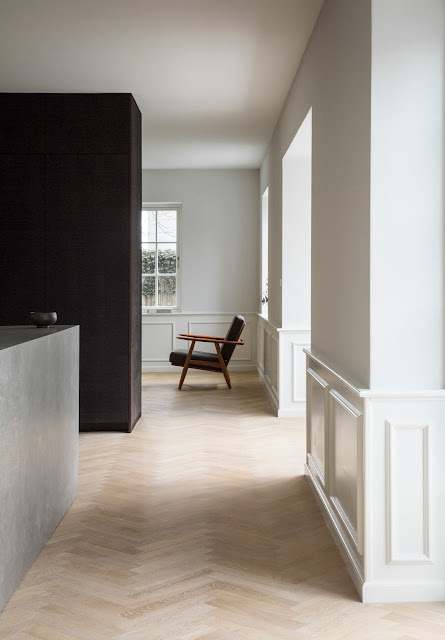 The apartment is in the top floor of a 19th century apartment building in central Oslo in Norway. 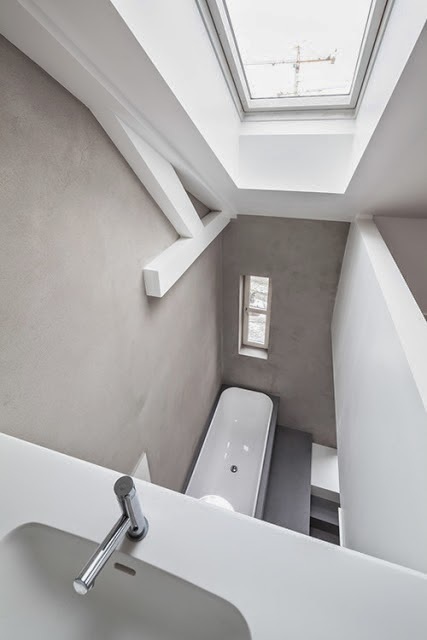 Purchasing the loft space above the apartment enabled the client to do a full scale refurbishment of the loft, bringing the two floors into one, unified space. 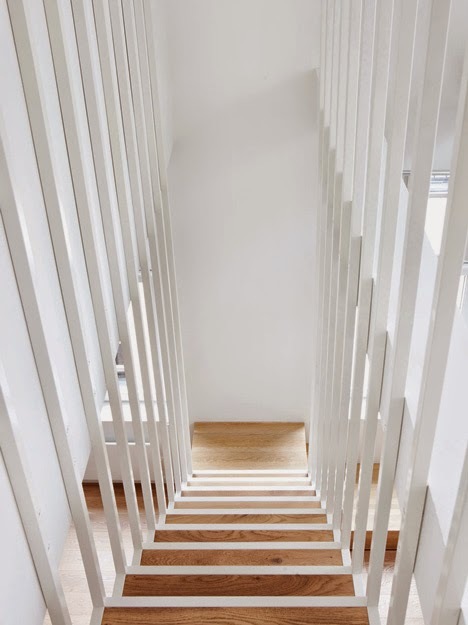 Through a thorough three-dimensional survey of the apartment and careful assessment of the means of escape, we were able to incorporate every nook and cranny and even part of the stairwell into the design. 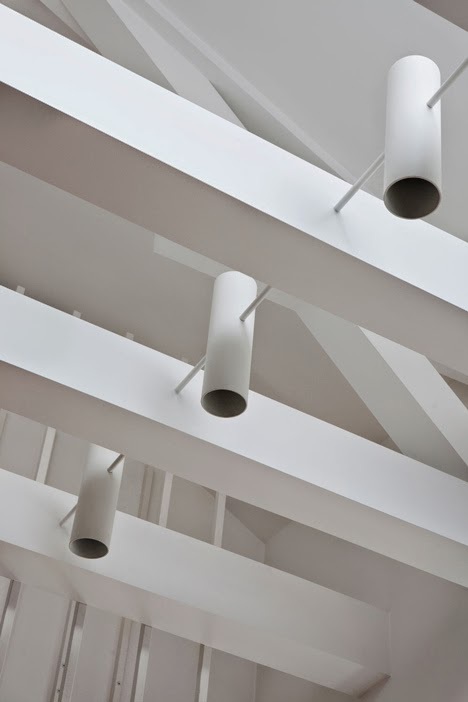 By fully utilising the level changes and opportunities we could introduce spatial drama with substantial vertical sight lines. 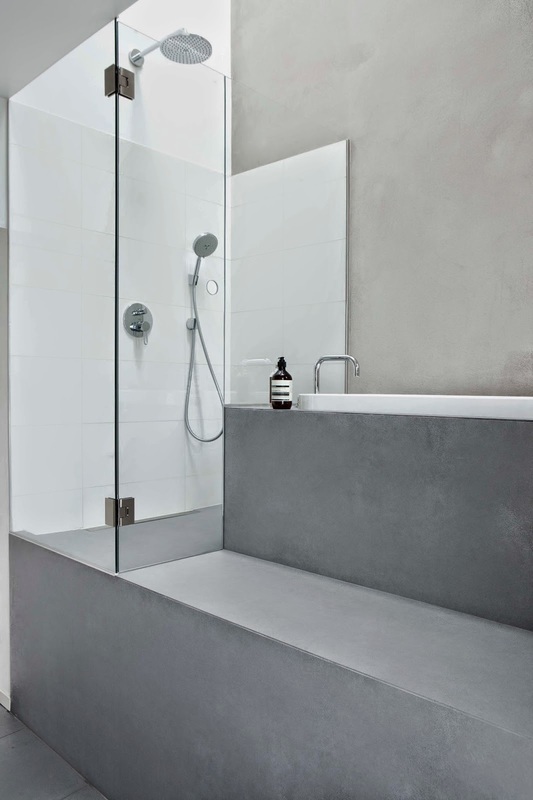 The en-suite bathroom to the master bedroom is organised over three levels by incorporating found spaces. 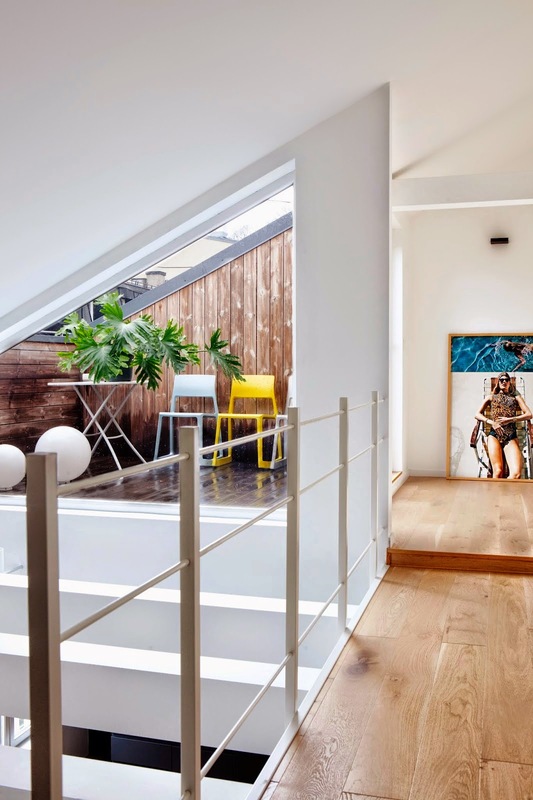 A sunny terrace has a large glass wall that brings evening light deep into the apartment. 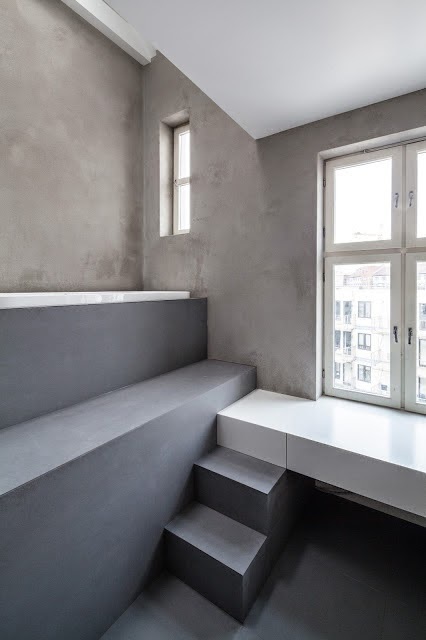 Some loft space has been sacrificed to create a double height space over the living room. 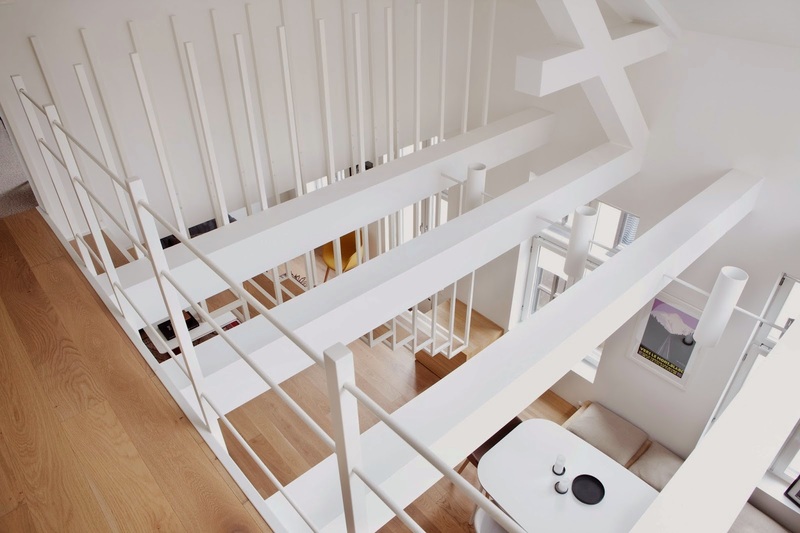 The centrepiece of the apartment is the feature staircase connecting the two levels. 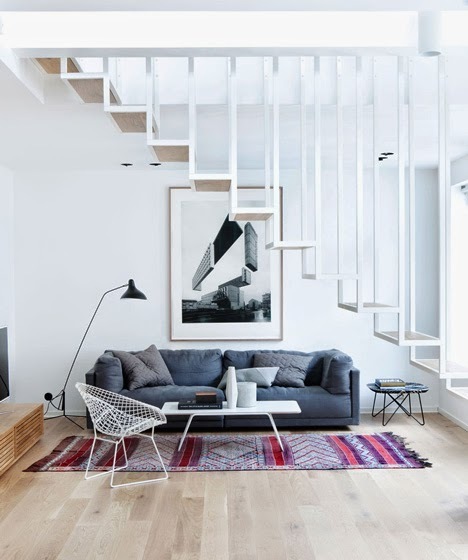 A modular, powder-coated, white steel stair is suspended between the joists and connects to a low storage/sofa unit that runs along the front façade. 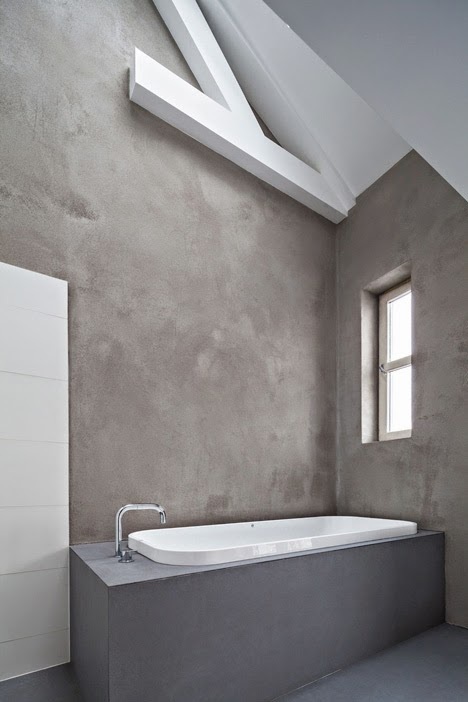 The bathroom incorporated several level changes, and by using large scale 100x300cm tiles, the impression is of one that is carved out of a single block of stone. 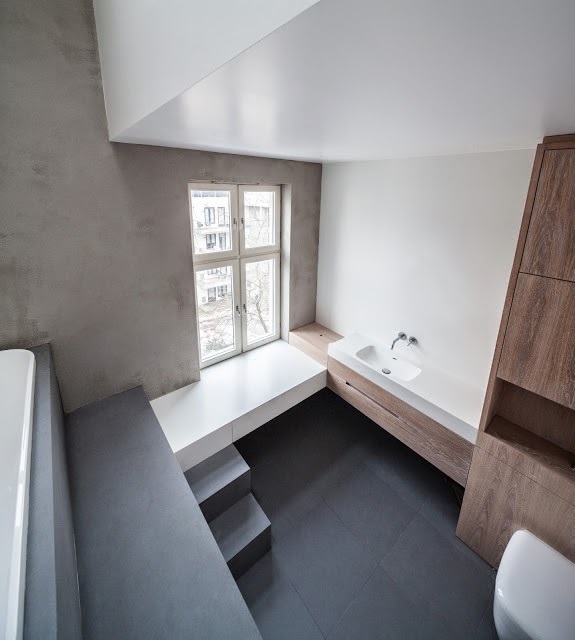 The original kitchen was tight, inefficient and north facing. 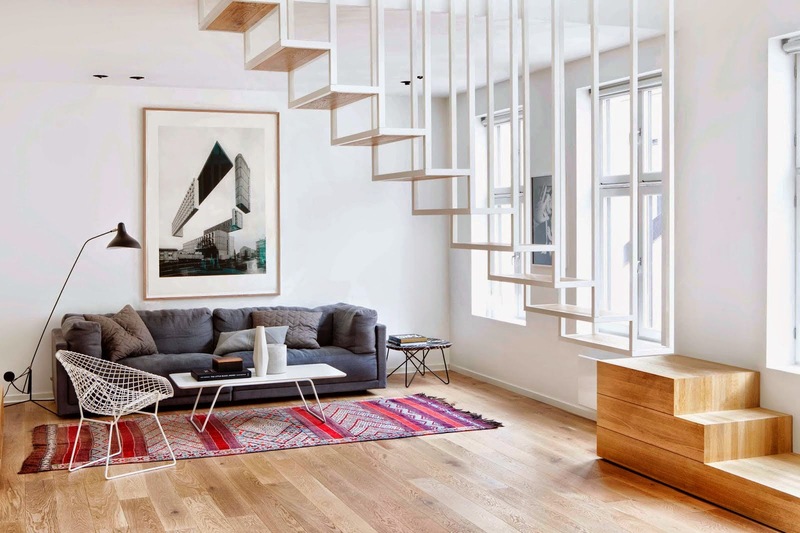 By moving it into the common areas we could create a light, airy and spacious space that becomes the social heart and integrates with the rest of the apartment. 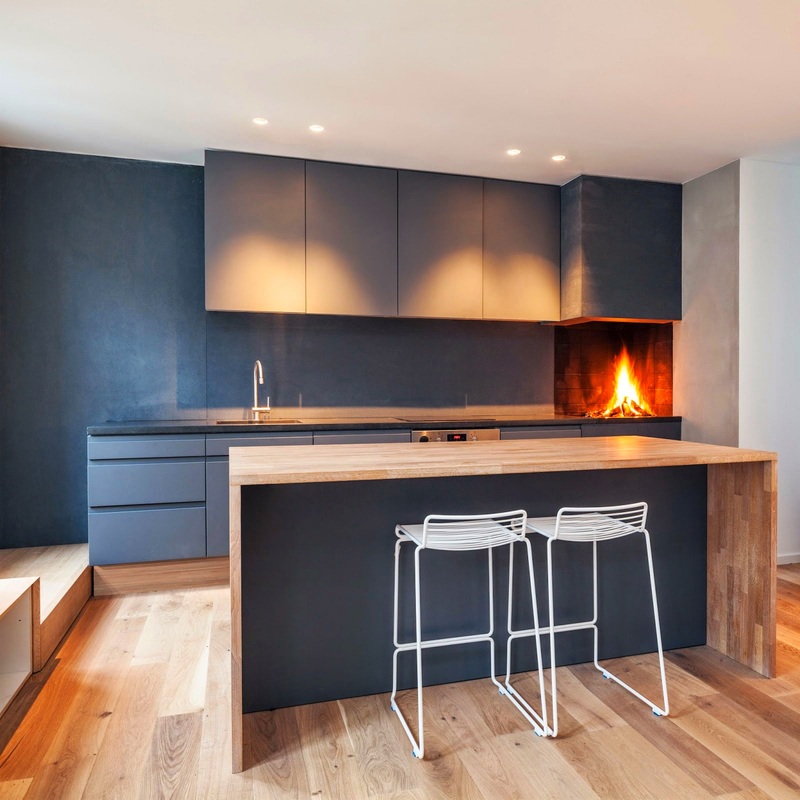 A small fireplace is integrated into the kitchen worktop and the kitchen fronts are painted to match the colour of the fireplace.